Here we'll post info about all the tots that are out.
. They were only featured in blue, yellow, and pink. Here at E.T, we very much like the legacy of Sonic tater-tot plushes. They recently have come out with NEW HALLOWEEN VERSIONS!!!! Bat, Frankenstien, Monster thing (? ), Vampire, skeleton, Ghost. Anyone think they know that last one? Also, while at the resturant, we saw something awesome! 1. The dude is somehow connected to Sonic, wether he is an employee or is friends with one er whatever. The funny thing is some sticker on the back of his car said a word that means tough. I forgot whatever word it was, but seriously. real tough, dude. Tater's aren't tough. They are soft. But they still pown. 2. The person who bought 20 Wacky Packs to get the toys inside isn't someone who'd have some huge tough word on the back of his car. If the person who had those tots bought wacky packs for all those, they need to get a hobby. And a life. But another intresting story; we were outside the car when some employee came around the corner with some car keys in his hand, and sorta, "Backed away slowly..." from us when he saw us crowded around his car. Not comepletely sure that was his, though. Well, we'll keep you posted. See ya! 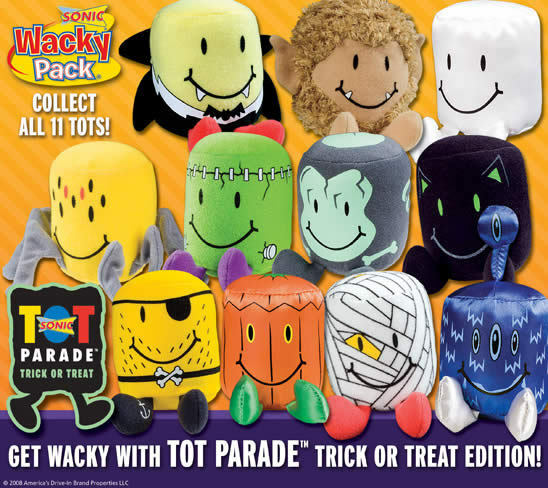 "Go to our graphics page and check out the graphic halloween tater-tots! Adopt one of the adorable tots!" "The Halloween tater tots were replaced, and here's my video talking about it. I linked to your blog on my blog since I wrote about the tots. should you put the zoo tots on here, MK? tots rule! i have all the zoo tots. I need help finding tots for sale! my mom collects them and i want to get her more but im unsure where to get them Sonic doesnt sale them anymore because the employees are taking them with out paying so where do i get them now? I'd check on e-bay to find any old tots for sale. Other than that, you can only wait for a new set to be released. Baby tots are almost always avalible, though, if you ask for them. yeah tots are awesome, i just recently started collecting them, the scuba tots, the game is awesome! What about Dino Tots I have them all go to coltand.blogspot.com to see about them. You can have a lot of fun with the tot, and make a room full of them! To collect them bit by bit is the way to go!